There are tons of people trying to join the booming health care field, and many of those people are considering becoming a pharmacy technician. The job of a pharmacy technician is to work under the direct supervision of a pharmacist and assist them with helping customers. They work on filling prescriptions, and a variety of other duties around a pharmacy setting. This can be in a hospital environment or in a retail type setting. The job outlook for a pharmacy technician shows that this career field is going to continue to grow along with many of the other health care careers. It is reported by the Bureau of Labor Statistics that it will grow 31% from the year 2008 to the year 2018. That is an amazing rate of growth when compared to the national average of all careers. Those that have certifications or experience are going to have more opportunities available to them. If this is a career choice that you take very seriously and want to pursue it long-term, it will be worth it to join a vocational program or college that offers programs related to the certification as a pharmacy technician. Then you can pass the exam and get your certification, making you a much more sought after commodity. 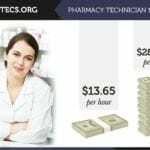 It can be a bit of pain to go through these programs before you even apply as a pharmacy technician, but it is well worth it in the long run. Once you have made the decision that you want to become a pharmacy technician, your next step most likely will be the education side of things. Although it may not be required in the state that you live in, most employers are going to want to see some sort of formal education and certification before you can apply to become a pharmacy technician. The training that students will receive in most certification preparation programs involves dosages, dispensing medications, and the different drugs and their use. There are other things such as customer service and training for the different technology that you will be working with. The next logical step is going to require the potential pharmacy technician to become certified by an organization such as the PTCB (Pharmacy Technician Certification Board). This will be an exam that tests all of the knowledge that you have learned in your programs and training. Once you have passed this exam, you are going to have many more opportunities available to you when compared to someone that is trying to get into entry level positions that doesn’t have this certification. Basically, if you want to have a successful career as a pharmacy technician with plenty of opportunities, you are going to need some sort of formal training and education. Also, making sure that you are certified should be a priority before you even apply for your first pharmacy technician job. This is a wonderful career that has plenty of upside, and the job growth statistics show that it is not going anywhere anytime soon. Previous PostPrevious What does a pharmacy technician do at CVS? Next PostNext What Does A Pharmacy Technician Actually Do?